After a couple days at my parents house, J and I headed back to the Chicago suburbs to spend time with her parents. After J and L went to bed, I decided it was time to get the sandwich worth driving to Chicago for. 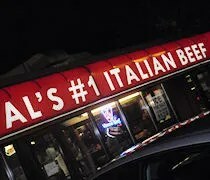 I wanted, ney, needed an Al’s Italian Beef. There’s all sorts of discussion over who has the best beef, but to me, there’s no comparison. I like Mr. Beef. I like Portillos. I LOVE Al’s. Now, I could have saved myself some time and money by going to the Al’s just a few blocks from my in-laws, but what’s the fun in that? Instead, I hopped on the Stevenson and headed towards University Village. This location on Taylor Street between Aberdeen and Carpenter Streets is the original Al’s Beef. The other locations are all franchise locations. They’re all delicious, but there’s just something about the Taylor Street location that you can’t get at the franchise. It was a busy Saturday night near the UIC campus which made parking a little bit of a struggle. There’s street parking all along Taylor Street, but I wasn’t having any luck as I was approaching the red, lighted awning with white lettering. As I pulled up to the building, I noticed a parking lot. I didn’t see any signage that prohibited parking there, so I pulled in and found an empty spot near the back by the alley. The first thing you notice about this Al’s location when you walk in is that there are no tables….well, no tables inside. They do have a couple picnic tables outside, but it’s the inside dining option that makes Al’s so special. There’s a large chest high counter that separates the “dining room” from the kitchen. There’s a cash register underneath some old menu boards. I didn’t even both with the menu. I stepped up to the counter and ordered like I knew what I was doing. I got myself Al’s Big Beef with hot peppers, dipped and an order of fries. I handed over the $11 and took a few steps to my right down the counter. As I was stuffing my wallet back in my pocket, a white bag with large grease stains was tossed in front of me. I grabbed y bag and headed over to the window where there’s a large metal rail, again, about chest high. That counter in the middle or these metal rails are your tables. There are no chairs. You stand over these flat surfaces or moreso lean over these surfaces to eat your beef. This is what makes Chicago Italian beef’s so special. 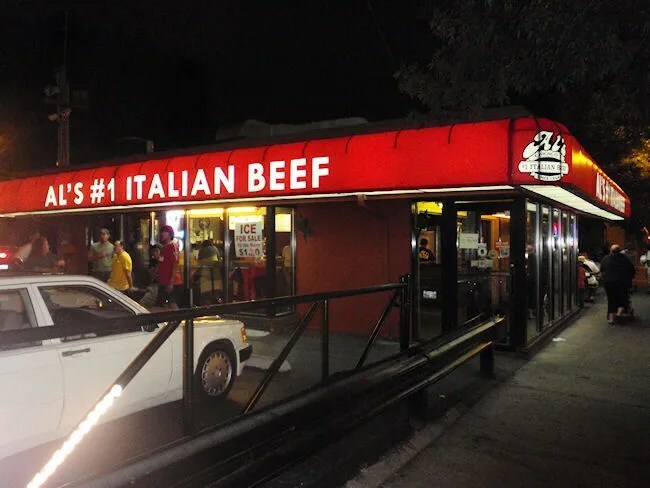 There are many places to get Italian beef’s in Chicago, but the journey of eating it is part of what makes it special. Al’s makes that journey memorable with their lack of furniture. I ripped open the bag and laid out meal. I got the stack of napkins ready because I knew I would eventually use them all. My strategy is to give the beef a few minutes to soak in the gravy, so I started with the fries. I love Al’s fries. They fresh cut and cook them to a golden brown the dust with salt. If there is such a thing as “Chicago Style” fries, these are it. 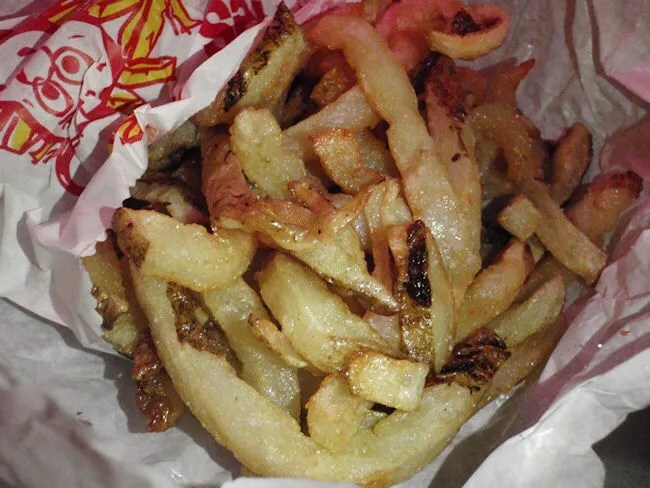 For whatever reason, I have always associated this kind of fry with a great Italian beef sandwich. After polishing off about half of the fries, I finally unwrapped my beef. 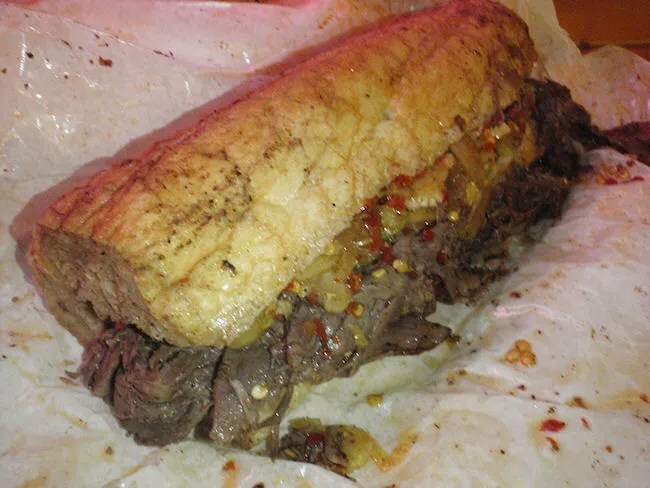 I’ve explained the construction of the Italian beef many times on this blog. In my opinion, it’s the perfect sandwich. The hearty bun soaks up the gravy yet stays together just enough to hold the thinly slice, tender beef and home made giardinara. I’m not sure I even took a breath. I pretty much inhaled the sandwich and have no regrets about it. In fact, if I wouldn’t have felt like such a fatty, I may have ordered a second sandwich. There is nothing on this planet that tastes as good as an Al’s Italian beef. Most people associate pizza or hot dogs with Chicago, but my opinion is that the Italian beef defines the city culinarily and Al’s is the definition of greatness. Great beef, outrageous prices. This place is about the bottom line. Don’t ever expect any buy one get one free or any other deals. I never would. I like the beef. I pay for the beef. That’s what they’re banking on, there’s a sucker born every minute willing to part with his hard-earned money to feed their bank account. You can get a better beef from Portillo’s or Johnny’s at a cheaper price. Johnny’s is great, in fact they just won Channel 7’s best beef recently. Al’s came in 11th. I will have to check them out next time I’m in town. I’ve always been a fan of Al’s…no matter how many places I try, I always end up back there.